When looking for bar stools for your restaurant, bar, cafe, or diner, you can’t go wrong with swivel bar stools. 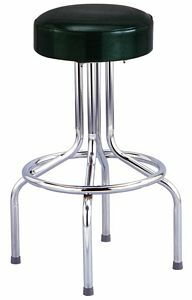 Swivel bar stools make great commercial bar stools. When someone sits on a bar stool, his natural tendency is to move around. If the bar stool is an upholstered vinyl or leather bar stool, you don’t want people’s movement to pull on the upholstery, you definitely need to get a swivel bar stool. Swivels lessen wear and tear on bar stool seats by absorbing the movement of the sitter. At BarStoolsandChairs.com, we sell swivel bar stools manufactured by Richardson Seating. Richardson Seating manufactures commercial swivel bar stools that work great for restaurants, cafes, diners, and hotels.